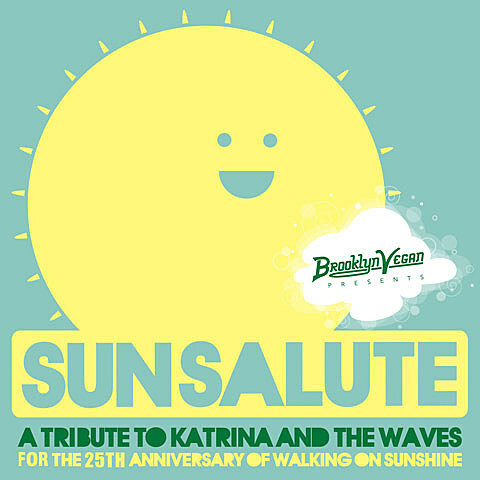 Monday, May 24th, 2010 marks the 25th anniversary of Katrina and the Waves‘ classic song “Walking On Sunshine”. To celebrate, the band has various things planned, one of which is a remastered version of the original song entitled “Walking On Sunshine 25″. The song will be released this coming Tuesday on iTunes (and other fine download establishments). You can also listen to it right now in the new (but looks old) video below. More importantly, I’ve teamed up with the band, and Primary Wave Music, to make a little EP featuring some of my favorite artists covering Katrina and the Waves songs. That’s the cover of the EP with the big picture of the sun up there. It was designed by Nathan J Crow. Right above that is track number one. Download Sam Amidon‘s “Walking on Sunshine” now, for free, and stay tuned for more details coming Monday!